1400rwhp Flamethrowing Camaro SS & New GPI Dyno RECORD!! This has been a very exciting week for team at GPI. We’ve finished up several very exciting builds, and this one is certainly no exception. This car was purchased by the current owner back in 2010, and has been a GPI car for many years. It started life as a heads / cam car, and after many years of saving and meticulously planning this build – it has become an absolute monster. This build features an ERL Block 427, a Hellion Twin Turbo System @ 26psi, Ported BR7 Brodix Heads, a full Fore Innovations Fuel System running both E85 & Meth, as well as an MSD Air Force Intake. 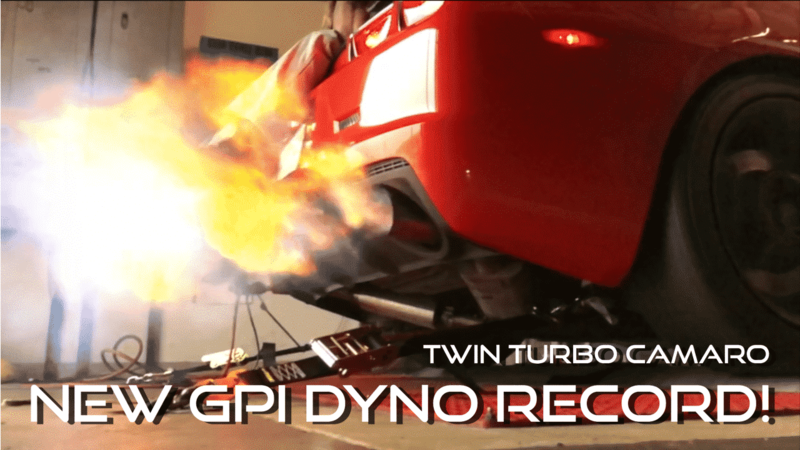 This combination comes together to make nearly 1400hp at the tire, and currently holds the record as GPI’s Dyno Champ! Hope you love your car as much as we enjoyed putting it together Anthony. 760 rwhp 6.2L Swapped Twin Turbo Sleeper 4WD Silverado!